The hydrogen isotopic composition (δD) of leaf wax long-chain n-alkanes from lacustrine sediments has been widely applied to reconstruct terrestrial paleoclimatic and paleohydrological changes. However, few studies have addressed whether the aquatic-derived n-alkanes can affect the δD values of lake sedimentary long-chain n-alkanes, which are usually regarded as a recorder of the terrestrial hydrological signals. Therefore, the heterogeneous origins and relative contributions of these lipids provide challenges for the interpretation of the increasing dataset as an environment and climatic proxy. Two recent studies "Compound-specific δD and its hydrological and environmental implication in the lakes on the Tibetan Plateau," and "Influence of aquatic plants on the hydrogen isotope composition of sedimentary long-chain n-alkanes in the Lake Qinghai region, Qinghai-Tibet Plateau" have been published in Science China Earth Sciences. The corresponding author is professor LIU Weiguo from State Key Laboratory of Loess and Quaternary Geology, Institute of Earth Environment, Chinese Academy of Sciences. The researchers stated that aquatic plants were primarily dominated by C23 and C25 homologues, but they also contained high relative abundances of long chain n-alkanes (C27-C33). 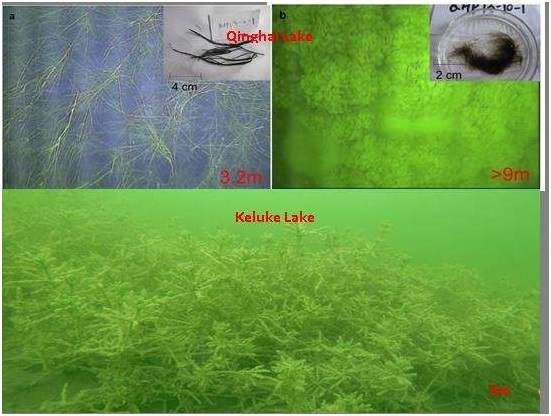 Submerged plants displayed slightly lower concentrations of long chain n-alkanes than that from terrestrial plants, indicating that submerged plants may have significant contribution of long chain n-alkanes to lake sediments. And this influence becomes more significant when submerged plants constitute a large percentage biomass in shallow lakes. δD values of n-alkane in aquatic plants were correlated significantly with the lake water δD values, but environmental condition changes (e.g. salinity) may also affect their δD values. For each algae and submerged plant sample, they found uniformed δD values of different chain length n-alkanes, implying that, in combination with other proxies such as Paq and Average Chain Length, the offset between the δD values of different chain length n-alkanes can help determine the source of sedimentary n-alkanes as well as inferring the hydrological characteristics of an ancient lake basin (open vs closed lake). By comparing the δD values of aquatic plants and surrounding terrestrial plants, they stated that the aquatic plants in a closed lake are significant enriched in D than those of terrestrial grasses around the lake, but they displayed similar δD values with surrounding grasses in an open lake, suggesting that the n-alkane δD values of the algae and submerged plants recorded the signal of D enrichment in lake water relative to precipitation only in closed lakes in arid and semi-arid area. This two studies focused on the n-alkane molecular characteristic and hydrogen isotope variations in aquatic plants on the Tibetan Plateau lakes, thus, creating essential implications of distinguishing the n-alkane input sources in lake sediments as a prerequisite for reliably use of n-alkane δD data in lake sediments to reconstruct palaeoclimatic and palaeohydrological dynamics of lake basins. In future, more attention should be paid on distinguishing n-alkane input sources in lake sediments and seeking reliable proxies to individually reflect the terrestrial or aquatic record variations.